We inform you that the offices, warehouses and stores of all our delegations of Spain (Barcelona, Madrid and Canary Islands) and Ireland will remain closed on Tuesday, December 25 and Tuesday, January 1. And in Spain they will remain open uninterrupted from 8 a.m. to 3 p.m. on Monday, December 24 and on Monday, December 31, for the Christmas festivities. 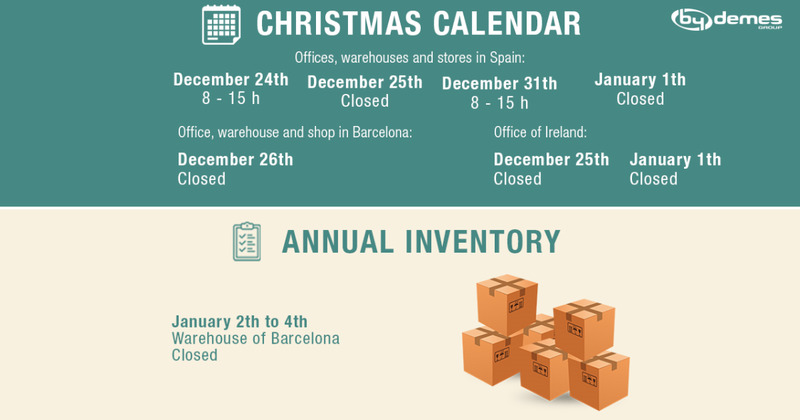 On Wednesday December 26 we will close in Barcelona and Ireland for the festivity of Sant Esteve. As every year, we will make the annual inventory in our warehouse in Barcelona, and it will remain inoperative from Wednesday 2 to Friday 4 January. For this reason, we ask that your orders be properly planned and you can receive the goods on time as one of our commitments.